We saw this coming a mile away through the smog-filled pollution choking Colorado’s national parks … The National Association of Manufacturers launched a multi-million dollar ad campaign today against the EPA’s unworkable plan to control the ozone, using national parks as an example of pristine areas that already don’t meet the new standards. It took exactly three seconds for the envirogreenies to respond, declaring that every single national park in the U.S. is so freaking polluted the air has to be cut with a knife. 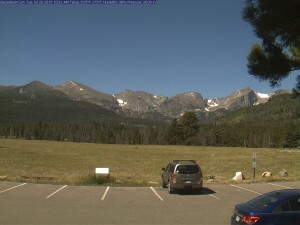 We just downloaded this live shot from Glacier Basin in Rocky Mountain. Disgusting! How did we ever let our park’s air get this polluted? 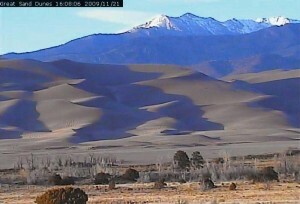 That sea of brown pollution moving in front of that ice-capped range … oh wait, that’s actually the sand dune. You almost had us suckered there, you crazy green kids! But the manufacturers association has a valid point. The most treasured, pristine regions of the U.S. can’t even meet these outrageous new rules. How in the world will Colorado achieve these new standards that Gov. Hickenlooper volunteered us to meet?